This post first appeared in 2015..
Today’s blog was inspired by Lori Deschene…. As we approach the last few shopping days till Christmas, I have noticed a few things: tempers are shorter, people are in a hurry, while store employees are tired and feeling unappreciated. The happiest time of the year has become the “let’s just get through this season”. No, I am not being Negative Nelly just stating some observations while I was out shopping the other night. The holiday season has taken on a new meaning for me. I can’t explain it – hubby would say it is old age. LOL. I have found myself NOT just getting a gift because I need to get something. I am NOT spending tons of money to show how I feel about someone. I have found myself showing compassion and understanding more than ever before. I am surprised at their response. Over the years, I have been shown kindness in many ways from friends and family but the kindness of strangers has taught me lasting lessons. Think about it as you check out at the register. Smile and greet the cashier. Ask them how they are doing. Maybe give someone a tip that they weren’t expecting. They all have struggles, and dreams, and goals, and responsibilities, and they too could benefit from someone showing them patience, kindness, and understanding if they’re a little slow or less than friendly. The other day I was with hubby as he stopped for gas. He ALWAYS pays cash. The total was $16 and he told the attendant to keep the change. Okay, so $4 isn’t a big deal but the smile that spread across the attendant’s face was priceless. He couldn’t thank us enough. A random act of kindness made a difference in someone’s day. The world is a better place when we see people beyond their nametags, and visualize everyone as someone who truly is doing their best. We’re all a little scared and a little rough around the edges. We’re all looking for love, support, acceptance, and appreciation. And we can all get and give these things every day, one tiny act at a time. Be patient and understanding with people who serve you, especially if they have a lot of customers to tend to. Empathizing instead of criticizing is a big thing. Getting up to help instead of sitting back and judging is a big thing. It may seem like a tiny thing, but sometimes the tiny things are the big things. And it’s big things like these that help us all feel seen, appreciated, and loved—and far happier for it. 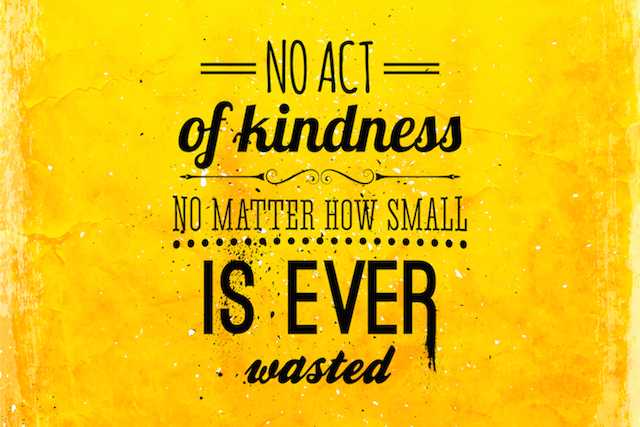 What Random Act of Kindness will you do today? Share it with us and let us all celebrate the spirit of Christmas this holiday season. ‹ PreviousThrowback: Loving Yourself When Your Too…. Next ›Throwback: Are You Building Relationships?